I managed to get to the range for a short time this last weekend and continued to practice self-defense drills. For this session I started with the IDPA 5x5 qualifier. This qualifier serves as a good baseline measure of competence. I shot the first qualifier cold on the San Antonio Police Department (SAPD) qualifier target. 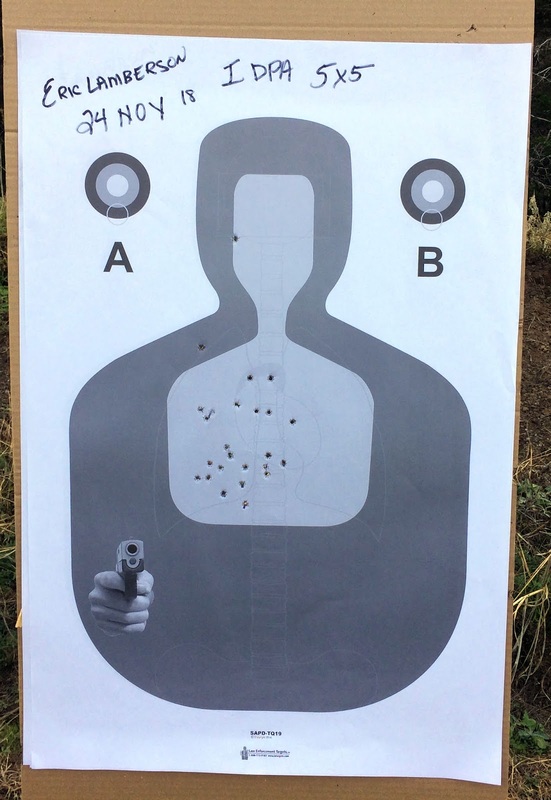 This target is slightly more forgiving than the standard IDPA target with a 9-1/2 x 9 inch “zero down” area in the body and a 5 x 2-3/4 inch zero down rectangle in the head. I used my SIG P320 carry pistol. This pistol has an X-Carry Grip Module, a 3.9 inch barrel, and the slide modified to use the Trijicon RMR06 with the 3.25 MOA dot. As you can see in the photo, I dropped on shot in the -1 equivalent on the target. The head shot on the target is a down zero when measured from the center of the rectangle. 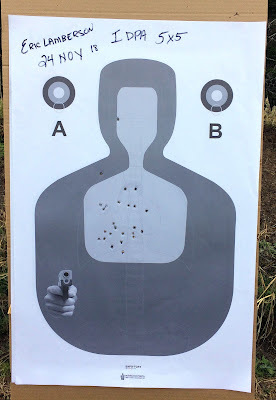 The score would have been a Master run on a standard IDPA target. I finished the 5x5 session with two qualifiers using iron sights only. I did OK with the irons shooting the exact same overall score of 21.42 for two runs. Even if you use a red dot sight, you should continue practicing with you iron sights periodically. 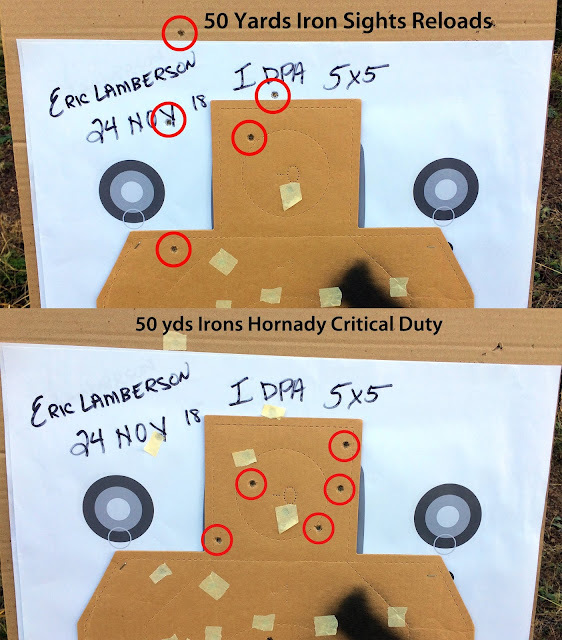 I stepped back to the 50 yard line and shot five head shots with my reloads and five with a new lot of Hornady Critical Duty standard pressure ammunition using iron sights. I periodically rotate my carry ammunition and always confirm that the point of impact for a new lot is where I expect it to be. 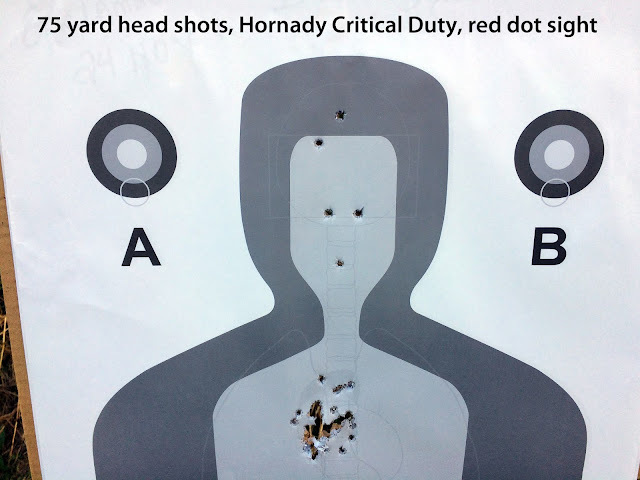 The Hornady Critical Duty is typically a bit more accurate than my reloads at longer distances. At 50 yards, the front sight that I have on my SIG completely covers the standard IDPA target's head. I finished the practice session with five head shots from 75 yards using the red dot sight and the Hornady Critical Duty ammunition. 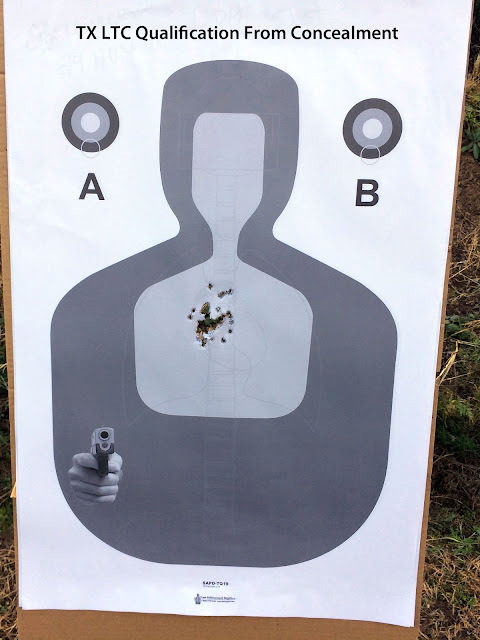 The picture below shows the results of these shots on the SAPD qualification target. This target’s inner (light-colored) bottle measures 6-1/4 x 3-3/4 inches.